WB SI 2018 Pre Result Check Here. West Bengal Police Sub Inspector / Lady Inspector Mains Admit Card Check Here. WB Police Notification is out. WB Police is recruiting for 1527 Sub Inspector / Lady Inspector Post 2018 Mains Posts. 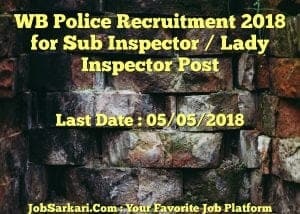 You can check WB Police - West Bengal Police last date, download WB Police notification, visit WB Police official website and check other WB Police Vacancy details.Complete Vacancy and recruitment Details about 1527 Sub Inspector / Lady Inspector Post 2018 Mains vacancies in WB Police are provided below by JobSarkari.Com only for you. Last Date for Apply Online/Offline 05/05/2018. Last Date for Payment of fees 10/05/2018. General / OBC / Other State Candidate Rs.270/-. SC / ST of WB Rs.20/-. Mode of Payment Application fees Can be Submitted through Online Mode Using Debit Cards/Credit Cards/Net-Banking of any Bank or Offline through E-Challn Making Payment at any Branch of United Bank of India (UBI). Sub-Inspector/Lady Sub-Inspector 824 154 111 350 88 1527. Age Relaxation Upper age limit is relaxable by 5 years for SC and ST and by 3 years for OBC candidates of West Bengal only. 2.Physical Measurement Test (PMT) & Physical Efficiency Test (PET). 1.The Candidates can apply through Online / Offline mode. 7.Online Application can be Submitted on or before 05th May 2018. 8.Click on the Apply offline Link given in Important Link Section. 9.Fill All the Mandatory Details in the Application form and Read All the Instruction before filling the form. 10.Candidate Need to take Printout of Full filled Application Form and Send Application form along with Required Documents to the Address Given below. on or before 05th May 2018. Q. 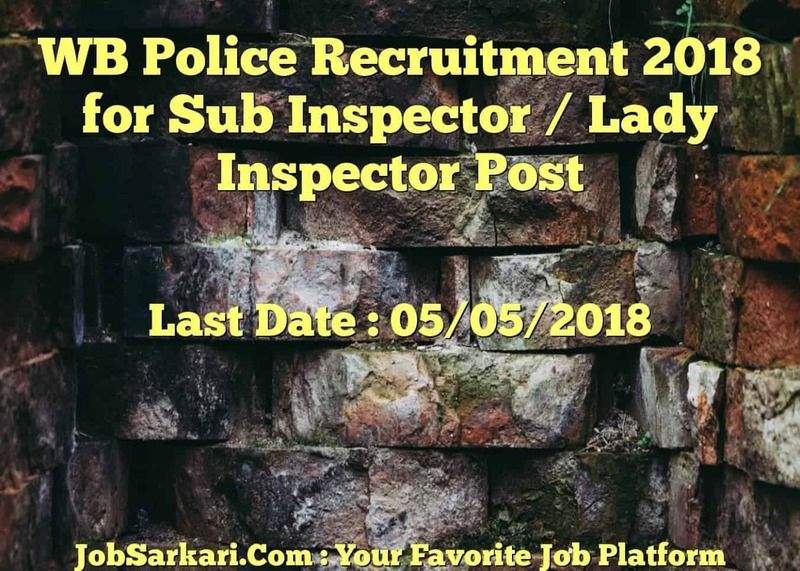 What is the Last Date For WB Police Sub Inspector / Lady Inspector Post 2018 Mains Vacancy ? A. Last Date for WB Police Sub Inspector / Lady Inspector Post 2018 Mains Posts is 05/05/2018. Q. What is the Form Type of WB Police Sub Inspector / Lady Inspector Post 2018 Mains Recruitment ? A. The Form Type for WB Police Sub Inspector / Lady Inspector Post 2018 Mains Posts is Offline, Online. Q. 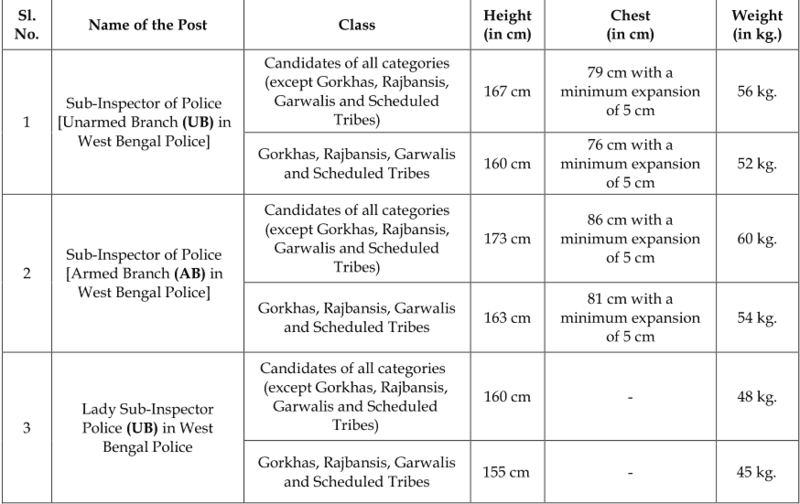 How many vacancies are available in West Bengal Police Sub Inspector / Lady Inspector Post 2018 Mains Posts ? A. There are about 1527 Vacancies in West Bengal Police Sub Inspector / Lady Inspector Post 2018 Mains Posts. Q. What is the Full Form of WB Police ? A. Full Form of WB Police is West Bengal Police .